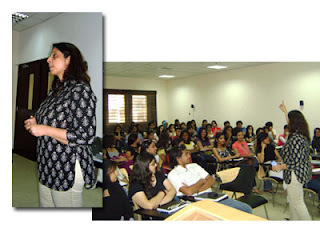 Home » Campus News » Public Relations Professional visits Manipal University. Public Relations Professional visits Manipal University. A workshop for Public Relations and Advertising was held for the second and third year media students by Ritu Motial. She has been in the field since the past twenty years and has worked with numerous big brands like Coca-Cola and Reader’s Digest. Her experience and examples from her own professional life proved to be extremely fruitful as she gave the students an insight into the industry of Advertising and P.R. Everyone attending the workshop found it extremely useful. According to Pooja Sagar, a third year student specializing in advertising and PR, said, “It was very informative. I particularly liked the way she tried to associate everything with her practical knowledge. I definitely learnt a lot. As I am interested in PR industry as a career option, I am looking forward to her next workshop.” Nawal Sakkaf, a second year media student said, “The workshop was actually very vital for our course since this year we are being introduced to advertising and PR. I think this is the best way we could have understood the course…gaining first hand information from someone within the industry itself.” The two hours turned out to be quite eventful and it was the perfect blend of imparting knowledge with a dash of fun which left all the students delighted.